Carpenteria californica, or Bush Anemone, is one of California’s loveliest, but hardest to find evergreen shrubs. It is prized by gardeners for its lush, white, sweetly scented blooms which flower late spring and summer. 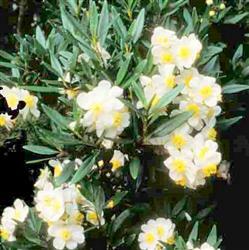 Under ideal conditions, this erect, evergreen shrub can grow 5 to 12 feet tall and 3 to 5 feet in diameter. Its thick, glossy, dark green on top and whitish on the bottom, making a striking backdrop to the shrub’s showy, white, fragrant 2-inch flowers. It is native to the dry granite ridges of the foothills of the southern Sierra Nevada in the Central Valley near Fresno. This bush does best when give dappled shade and light sun, especially if planted in an inland garden. It will thrive if planted 3 or 4 feet from a high water area where it will benefit from the drainage. Once established it can survive on very little water, but will look best with moderate supplemental water. It maintains a neat, rounded form but can be lightly pruned if desired.